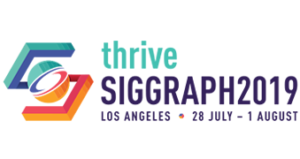 Volunteers establish overall strategy for the annual SIGGRAPH conferences, manage conference planning and production, and oversee conference programs. The Art Gallery chair compiles and mounts an exhibit of innovative, high-quality, fine art and/or design produced using computer graphics and interactive techniques. The chair manages the review process, either juried or curated. The chair oversees space design, interaction with contributors, shipping, assembly, and tear down of the gallery. The Art Papers Chair manages SIGGRAPH’s forum for honoring artists and their artwork, as well as their process of making art and its place in society. Art Papers illuminate and explore the changing roles of artists and the methods of art-making in our increasingly networked and computationally mediated world. Art Papers presented at the SIGGRAPH conference are also published in a special issue of Leonardo, The Journal of the International Society of the Arts, Sciences and Technology. The issue also includes visual documentation of the works exhibited in the Art Gallery. The Computer Animation Festival Chair produces an entertaining and informative representation of the highest quality computer animation. The chair recruits and supervises both a sub-committee and a jury, and interacts with contributors on formats, timing, and many other editing requirements necessary for final production. The SIGGRAPH Conference Advisory Group (CAG) and SIGGRAPH Asia Conference Advisory Group (SACAG) manage long-term conference issues that extend beyond individual conferences. They are composed of a voting group (the Chair, the Conference Chairs of recent and upcoming conferences, and two Executive Committee representatives), and the Conference Event Director, who is a non-voting member. Staff and invited guests participate in meetings and discussions as needed. The Conference Chair is a volunteer responsible for planning and producing an annual conference. The Chair works closely with the Event Director, the Executive Committee, the conference program chairs, and contractors to ensure the success of the conference. Conference Chairs are normally selected 2.5 – 3 years prior to their conference, and they serve one year past their conference year. The Courses Chair is responsible for the planning, selection process, and implementation of the annual conference courses program. The Educators Program Chair compiles a program that explores innovative uses of computer graphics and interactive techniques in education, including sessions on the teaching of computer graphics and interactive techniques. The chair may curate presentations, as well as recruit and supervise a jury. The chair interacts with contributors on formats, timing, and other requirements, and manages seminars. The Emerging Technologies Chair is responsible for the planning, selection process, and implementation of the annual conference Emerging Technologies program. The Games Chair compiles a program exploring issues and innovative uses of computer graphics and interactive techniques in the gaming industry. The chair interacts with contributors on formats, timing and other requirements, and manages program content. The General Submissions Chair is responsible for overseeing the implementation of exhibits of innovative, high-quality, fine art, and/or design produced using computer graphics and interactive techniques; a collection of leading-edge applications and interactive technologies, a broad spectrum of educational sessions on innovative uses of computer graphics and interactive techniques, and sessions where experts in the field debate, dispute, and/or otherwise reflect on the past, present and future of computer graphics and interactive techniques. The General Submissions Juror is responsible for helping to review and make recommendations of the content submitted to General Submissions. This content consists of exhibits of innovative, high-quality, fine art, and/or design produced using computer graphics and interactive techniques; a collection of leading-edge applications and interactive technologies, a broad spectrum of educational sessions on innovative uses of computer graphics and interactive techniques, and sessions where experts in the field debate, dispute, and/or otherwise reflect on the past, present and future of computer graphics and interactive techniques. The GraphicsNet Chair is responsible for the planning and implementation of the on-site networking infrastructure necessary to support the annual conference. The GraphicsNet Chair works closely with the Conference Chair, the Conference Event Director, volunteers, the convention center, and contractors to produce sophisticated high-speed communication channels that link various programs within the conference both internally and externally via the internet. The Mobile Chair produces a one-day program that includes entertaining and informative representation of the highest quality state of the art in mobile graphics and apps. The chair recruits and supervises both a sub-committee and a jury, and interacts with contributors on formats, timing, and many other requirements necessary for final production. The Posters Chair is responsible for the planning, selection process, and presentation of the Posters Program at the conference. This program includes work that is still being completed and student research. The Production Sessions Chair is responsible for the planning, selection process, scheduling, and producing each production session in cooperation with the relevant studio for the annual conference. The Real-Time Live! Chair produces an entertaining showcase representing the most innovative and interactive real-time graphics created in the last 12 months. The chair recruits and supervises both a sub-committee and a jury, and interacts with contributors on formats, timing, and many other editing requirements necessary for final production. The Student Volunteers Chair manages a large team of students who support the operational needs of the conference. In the process, these future computer graphics and interactive technique gurus gain valuable professional and personal experience, are exposed to technology and creative endeavors, and often meet and work with pioneers in the field. The chair works with the committee to implement the selection process, determine volunteer requirements for the various programs, and coordinate the student volunteer activities during the conference. The Studio Chair leads a staff of volunteers to plan and implement a creative and robust workshop environment where conference attendees can experiment with various input and output technologies, and explore pre-selected conference work. The chair oversees Studio content, schedules activities, and coordinates acquisition of equipment and resources for this hands-on workshop. The Technical Papers chair manages the world’s premier forum for the most definitive research in computer graphics and interactive techniques. The chair recruits and supervises a committee of expert reviewers representing a diverse disciplinary field, interacts with contributors on presentation, timing, and other requirements, and coordinates the presentation sessions.